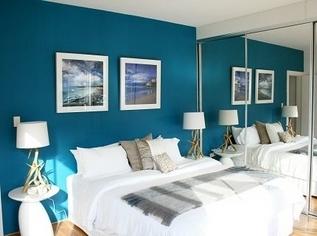 The Sandridge Apartments are a boutique apartments, located at the south end of Bondi Beach. These fabulous beachside retreats are only a stones throw from the main beach area, Bondi Beach shops, bars, restaurants and cafes, & are right next to the stunning Bondi to Bronte coastal walk. There are two apartment types, the 'Standard 2 Bedroom Apartment' and the 'Premium 2 Bedroom Apartment + Study' Apartment. The 'Standard 2 Bedroom Apartment' has two spacious bedrooms, each with a king size bed (second bedroom can be separated into 2 x single beds) and built in mirrored wardrobes. The apartment comprises of two large bathrooms, one with a full size bathtub and twin sinks, the second with walk in shower, toilet and large granite vanity. The laundry facilities are also in the second bathroom, with top loader washing machine, iron, ironing board and detergent is provided. The lounge, dining and kitchen areas are one enormous open plan space with fresh white walls, 3m high ceilings, and an office area overlooking the terrace. The entire apartment has polished American Oak timber floors and plenty of natural sunlight. Leading from the lounge area is a spacious outdoor terrace which peeks through to Bondi Beach and the neighbouring park. A fabulous L shaped outdoor lounge setting makes this a perfect spot for relaxing on a balmy summers evening. 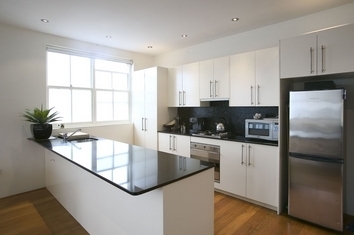 Kitchens are fully equipped with full size fridge/freezer, dishwasher, microwave, oven & cooktop. All cooking utensils, cutlery, glassware and crockery is supplied, as well as detergents and tea towels. Living room furniture is modern minimalist with beautiful Knoll marble dining table, Bertoia wire chairs, sleek black L shaped lounge and bertoia armchairs. Not forgetting the 42" LCD TV, DVD player, CD stereo and Free Foxtel Cable TV. The 'Premium 2 Bedroom + Study Apartment' is a two story apartment, consistin of two spacious bedrooms, each with a king size bed (second bedroom can be separated into 2 x single beds) and built in mirrored wardrobes. The lounge, dining and kitchen areas are one enormous open plan space with fresh white walls, 3m high ceilings, and views out to the ocean and beach. All living areas have polished American Oak timber floors and the stairways, bedrooms and office have wall to wall carpet. The apartemnt is bright and airy and receives plenty of natural sunlight from morning to evening. Kitchens are fully equipped with full size fridge/freezer, dishwasher, microwave, oven & gas cooktop. All cooking utensils, cutlery, glassware and crockery is supplied, as well as detergents and tea towels. Living room furniture is contemporary and stylish with beautiful whitewashed recycled timber dining table, white leather Bertoia wire chairs, sleek white leather L shaped lounge and white Barcelona armchairs. Not forgetting the funky white 32" LCD TV/DVD combo, CD stereo and Free Foxtel Cable TV. Free 512k (wired) broadband internet and local phone calls, free Foxtel Cable TV and free Molton Brown Bath Products are an in all apartments. Rates for 3 or 4 nights stay. Each apartment has two spacious bedrooms with built in wardrobes, each with a king size bed (second bedroom can be made into 2 x single beds).Also a third bedroom/study rooftop room. The apartment also has two large bathrooms, one with a full size bathtub and twin sinks. All bathrooms have beautiful Molton Brown Bath and Body Products and are fully supplied with towels and a hairdryer. Leading from the lounge area is a spacious and stunning outdoor terrace which peeks through to Bondi Beach and the neighbouring park. Discount rates for 5 or 6 nights stay. Each apartment has two spacious bedrooms with built in wardrobes, each with a king size bed (second bedroom can be made into 2 x single beds).Also a third bedroom/study rooftop room. The apartment also has two large bathrooms, one with a full size bathtub and twin sinks. All bathrooms have beautiful Molton Brown Bath and Body Products and are fully supplied with towels and a hairdryer. Leading from the lounge area is a spacious and stunning outdoor terrace which peeks through to Bondi Beach and the neighbouring park. Discount rates for 7 nights stay and longer. Each apartment has two spacious bedrooms with built in wardrobes, each with a king size bed (second bedroom can be made into 2 x single beds).Also a third bedroom/study rooftop room. The apartment also has two large bathrooms, one with a full size bathtub and twin sinks. All bathrooms have beautiful Molton Brown Bath and Body Products and are fully supplied with towels and a hairdryer. Leading from the lounge area is a spacious and stunning outdoor terrace which peeks through to Bondi Beach and the neighbouring park. Rates for 3 or 4 nights stay. Each apartment has two spacious bedrooms with built in wardrobes, each with a king size bed that can be separated into 2 x single beds (4 x singles in total). Each apartment also has two large bathrooms, one with a full size bathtub and twin sinks. All bathrooms have beautiful Molton Brown Bath and Body Products and are fully supplied with towels and a hairdryer. Leading from the lounge area is a spacious outddor terrace which peeks through to Bondi Beach and the neighbouring park. Discount rates for 5 or 6 nights stay. Each apartment has two spacious bedrooms with built in wardrobes, each with a king size bed that can be separated into 2 x single beds (4 x singles in total). Each apartment also has two large bathrooms, one with a full size bathtub and twin sinks. All bathrooms have beautiful Molton Brown Bath and Body Products and are fully supplied with towels and a hairdryer. Leading from the lounge area is a spacious outddor terrace which peeks through to Bondi Beach and the neighbouring park. Discount rates for 7 nights stay and longer. Each apartment has two spacious bedrooms with built in wardrobes, each with a king size bed that can be separated into 2 x single beds (4 x singles in total). Each apartment also has two large bathrooms, one with a full size bathtub and twin sinks. All bathrooms have beautiful Molton Brown Bath and Body Products and are fully supplied with towels and a hairdryer. Leading from the lounge area is a spacious outddor terrace which peeks through to Bondi Beach and the neighbouring park. Free broadband internet and free local phone calls are available in all apartments. Work desk and chair in 'Standard 2 Bedroom Apartment'. Office with full size work desk and chair in 'Premium 2 Bedroom + Study Apartment'. PLEASE NOTE There is no reception or front desk at the apartments, so guests need to check in by appointment. Please provide a valid email address so Apartment Hotel can contact you to arrange check in. Check in is from 3pm and checkout at 10am. Children are very welcome at our apartments. They form part of the total number of guests per apartment. Rates are for a amaximum of four guests and any additional guests must obtain the prior consent of management prior to arrival. This includes a fold away bed, additional bedding and towles. Babies are not counted as the total number of guests. We have baby cots and high chairs available free of charge. There is one lock up garage space available at a rate of $20 per night. Smalll to medium cars only - No large vehicles. Drive toward Bondi Beach along Bondi Road. As you get to the bottom of Bondi Road where it meets the water and curves around to the left to become Campbell Parade, turn right into Sandridge Street. Bondi Beach Shops, Restuarants, Cafes and bars.